The National League for Nursing has selected a faculty member in Indiana State University's College of Nursing, Health, and Human Services for a year-long leadership development program. 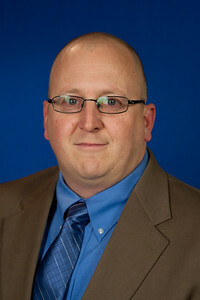 Jack Jaeger, director of the Rural Health Innovation Collaborative (RHIC) Simulation Center at Union Hospital, is among 20 nurse educators, chosen from colleges and universities around the country, to study for one year in the league's Leadership Development Program for Simulation Educators. The program is designed for those interested in assuming a leadership role in nursing education's simulation programs' research or administration. "It was a tremendous honor to be selected to participate in such a prestigious program," Jaeger said. "I look forward to the opportunity that it provides to me and the Simulation Center as well." As director of the RHIC Simulation Center, Jaeger leads a group of 10 organizations that are collaborating to bring inter-professional educational opportunities to current and future healthcare providers. In 13 years as a clinical educator and nurse in critical care, emergency care, and as coordinator for sepsis management, he has a proven record of leading medical teams to improve education and patient outcomes, league officials said in announcing Jaeger's selection. This year's cohort is the second to be selected to study under the direction of Pamela Jeffries, author of numerous scholarly articles on the subject and editor of "Simulations in Nursing Education: From Conceptualization to Evaluation." Jeffries is a professor in the department of health systems and outcomes and associate dean for academic affairs at Johns Hopkins University School of Nursing. She is nationally known for her research and work in developing simulations and online teaching and learning. "I am delighted that Dr. Jeffries has agreed to direct this important initiative for a second year, working with a new group of talented emerging leaders in simulation," said Beverly Malone, chief executive officer of the National League of Nursing. "This program has already proven to be an intensive and very worthwhile learning experience that, consistent with NLN's core values of caring, integrity, diversity, and excellence, prepares all participants to propel the science of nursing education and be visionary thought leaders for the 21st century and role models to the next generation." Participants spend the year engaged in varied activities that examine key issues on a dual track of research and administration, before choosing a single area of focus. Following a two-day meeting in Orlando in connection with the league's 2011 Education Summit, the group will participate in leadership development webinars; exchange ideas and best practices in private forums; review existing research; visit simulation centers around the country to evaluate resources and operations; consult with manufacturing representatives on equipment issues; and contribute to a group project to develop or expand the Simulation Information Resource Center (SIRC) website. For more information about the Leadership Development Program for Simulation, contact Mary Anne Rizzolo at mrizzolo@nln.org. Dedicated to excellence in nursing, the National League for Nursing is the premier organization for nurse faculty and leaders in nursing education, offering faculty development, networking opportunities, testing services, nursing research grants, and public policy initiatives to its 34,000 individual and 1,200 institutional members. Jack Jaeger, an ISU faculty member and director of the Rural Health Innovation Collaborative's Simulation Center, is among 20 nurse educators from around the country chosen for the National League for Nursing's Leadership Development Program.